Each month we get a whole new stack of them cluttering our home, desks, and filing cabinets. I complied a list of ways to help you simplify and condense the amount of time and effort put towards your paper filing system. eBills or online statements. Many businesses and banks offer your monthly bills and statements online. They send you an email notification when your bill is available. Some offer automatic monthly payments so you don’t ever have to worry about a late payment. Some offer alerts when a payment is due. Most of the time, all you have to do is sign onto the businesses’ website, register for an account, and select the paperless or eBill option. This way also saves the company money from printing, paper, and postage. And it is more eco-friendly. Online bank or credit card payments. Most national and some local banks and credit cards offer an online service through their sites for you to pay your bills. You can have it scheduled and/or automated. Even though my bank doesn’t have all my local utility service on file, they still offer to mail out a check for me if I schedule it online. Save me the cost of checks and postages. 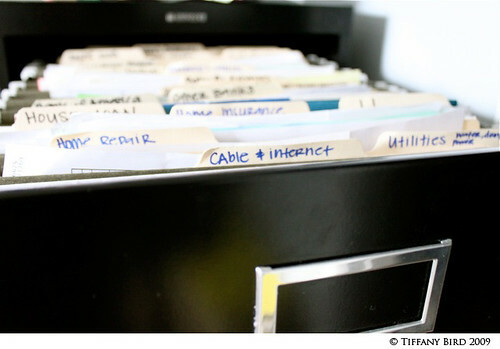 Keep file folders near where you pay bills. Whether you pay bills online or by checks, keep your filing cabinet close to where you do your bills. That way as soon as you pay, you can file it away. And retail stores such as Target, The Container Store, and Ikea offer visually appealing filing cabinets to motivate you to use them. Create a mail habit. Get the mail, walk in the house, and then what? Do you toss it in a pile of mail to sort through later? Do you eagerly check out every envelope and ad? Find some kind of system that works for you and your mail then make it a habit. Whether you’re the type who needs a mail center where you categorize mail or you toss it all except the bare essentials, make sure you keep a recycling bin nearby to recycle the junk stuff. Organize important documents by person. Have a folder for each person in your household. Then put copies of important documents for that person in their folder. These types of documents would be Social Security cards, birth certificates, passports, medical records, school records, marriage certificates, and so forth. You will want to keep originals of these documents in a safer place. More info on that coming Thursday.